Sleep is one of the most important aspects of our life, health and longevity and yet it is increasingly neglected in twenty-first-century society, with devastating consequences- every major disease in the developed world - Alzheimer's, cancer, obesity, diabetes - has very strong links to deficient sleep. 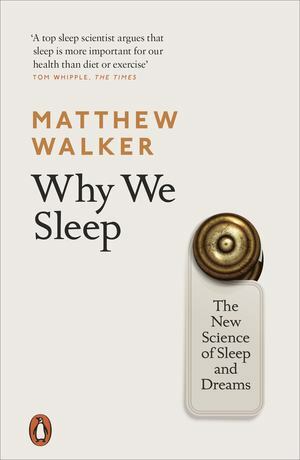 In this book, the first of its kind written by a scientific expert, Professor Matthew Walker explores twenty years of cutting-edge research to solve the mystery of why sleep matters. Looking at creatures from across the animal kingdom as well as major human studies, Why We Sleepdelves in to everything from what really happens in our brains and bodies when we dream to how caffeine and alcohol affect sleep and why our sleep patterns change across a lifetime, transforming our appreciation of the extraordinary phenomenon that safeguards our existence. * Lack of sleep affects hunger. People who sleep less are hungrier and eat more. They also choose less healthy foods. If you’ve ever had any kind of sleep problem, you’ve probably browsed the supplements section at your local pharmacy. Most common among those supplements? Melatonin. But does melatonin actually work? The author recommends taking melatonin only if you’re going to be traveling and experiencing jet lag. To understand why, you need to know how the body actually goes to sleep in the first place. You’ve probably heard the term “circadian rhythm” before. Basically, your circadian rhythm is your level of energy or wakefulness throughout the day. Circadian rhythms are kind of a cycle: most people will feel awake in the morning, experience a dip in the early afternoon, feel awake in the early evening, and then get tired around bed time. Recent research has increased our understanding of the circadian rhythm by quite a lot. Actually, the 2017 Nobel Prize in Physiology or Medicine was awarded to circadian rhythm researchers. The whole system is pretty complicated, but at a simple level, our bodies produce melatonin to signal when it’s time for us to sleep. In general, we’re better off trying to stimulate natural melatonin production than taking outside melatonin. Part of the reason is that there’s a second system our body uses for sleep. When we’re awake, our bodies gradually increase the concentration of adenosine in our brains. As more adenosine builds up, we feel more “sleep pressure,” or desire to sleep. The longer you stay awake, the more sleep pressure you experience, which is why you can still fall asleep in the middle of the day if you’re truly exhausted. When you sleep, your body dumps adenosine. In an ideal situation, you dump adenosine during a quiet period of your circadian rhythm, so that you can have a truly deep sleep. The book Why We Sleep also goes into the two most important types of sleep: Rapid Eye Movement (REM) sleep and Non Rapid Eye Movement (NREM) sleep. What does all this have to do with health and fitness habits? If you’re sleeping less, you’ll find it harder to make the decision to go to the gym. If you’re sleeping less, you’ll get worse results from the gym. If you’re sleeping less, you’ll find it harder to eat healthily. Especially if you’re just getting your fitness habit up to speed, not sleeping will make everything harder. But also: “sleep more” isn’t exactly helpful advice. Here are a few specific ways the book (and I) recommend trying to adjust your schedule to get better sleep. * No screens at night. Blue light from screens inhibits your melatonin production, which makes it harder to get to sleep. * Exercise, but not right before bed. People who exercise sleep better, but if you do it right before bed your body temperature and heart rate will still be up. * Sleep in a cold room. Your core temperature drops when you sleep. Sleeping in a cold room helps that process. * Take a hot bath or shower. When you take a hot bath, blood rises closer to the surface of your skin. Once you’re out of the bath, that makes it easier to release heat and actually lower your body temperature. * Avoid sleeping pills. Sleeping pills don’t put you to sleep. They make you unconscious. Sleeping pills limit your deep NREM sleep and REM sleep, so you aren’t actually getting the rest you need. * Avoid alcohol before bed. Alcohol inhibits deep NREM sleep and REM sleep, so you won’t actually get rested. * Avoid caffeine in the afternoon. Caffeine has a half life of 5-6 hours, meaning that it takes that long for your body to process just one half of the amount you took in. If you drink coffee in the afternoon, it will still be affecting you at night. * Maintain a consistent schedule.Your body likes routines. If you wake up and go to sleep at roughly the same time each day, you’ll find it easier to sleep. * Mood lighting. Dim the lights before bed to facilitate melatonin production. * Keep the room dark. Blackout curtains or a sleep mask are the way to go, so that the sun doesn’t wake you up too early.